Windows of opportunity to teach life lessons to children can come at the most unexpected times. But these unplanned times may be some of the most memorable. When our youngest child was 4 years old, he was working with me in the yard. In the process, we found a tiny dead bird beneath one of the trees. It grabbed his attention and started a series of questions that provided a means to discuss even bigger issues of life. His little mind struggled to understand what had happened and why she had died. She was a young bird without even her adult feathers, so I wasn’t able to tell what kind of bird she was. Her nest was above us somewhere, but I couldn’t spot it. Why? That was probably the word my son used most: Why did she die? Why didn’t her parents protect her? Why did she leave her nest? Why didn’t she fly back up to her nest? I’ve observed many sets of parent birds bring their babies along from an egg to a fully capable adult. 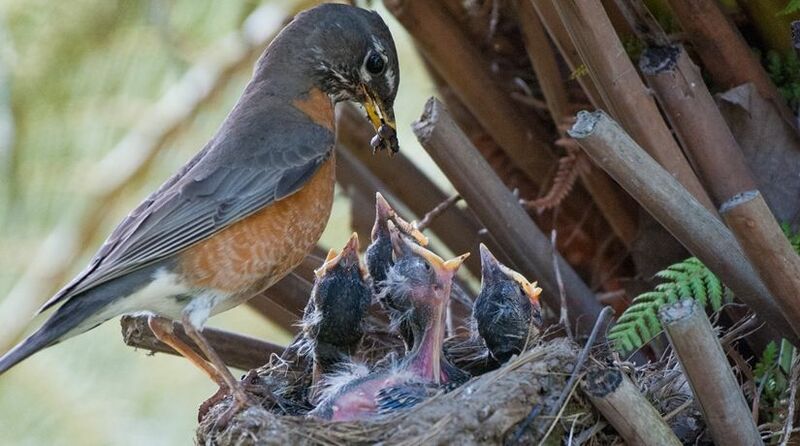 They work hard, tag-teaming the nest to provide enough food for a growing and ravenous family. They will work tirelessly to protect the nest, placing themselves in harm’s way to lure a threat away from their babies—at times even making the ultimate sacrifice so that their little ones may live and have a chance to thrive. It is such a contrast to watch the depth of love and dedication of the parents, and then see the selfish nature of the babies, each pushing aside its siblings to grab food for itself. In some cases a baby’s greediness will even cause a younger or weaker sibling to starve. It seems they don’t yet have any instinct to care for and protect one another. As the babies grow and mature, it seems that every year a few are lost when they try to leave the nest too soon. Mom and Dad try their hardest to keep them in the nest where they are safe and can be provided for, but in some young birds—perhaps like the little one we found—it seems the urge to fly is too great. Perhaps she saw her parents flying back and forth, looked up at the deep blue sky beckoning her to travel its limitless expanse. She saw other birds soaring so gracefully overhead, and she yearned to join them, to soar up to greet each new day and travel free and unfettered. She was, after all, born to fly! But as with all things, it must be at the right time. Time moves relentlessly on, marking the progression of life mindlessly and without feeling. It is ready on the one hand to handsomely reward those who use it wisely, while crushing without mercy those who waste it or refuse to follow the wisdom of those who have traveled this way before. So it was for our little bird. Perhaps she was in a hurry to get on with one adventure after another, but she wasn’t yet prepared. She hadn’t taken enough time and didn’t even have the feathers that would allow her to fly. Did she reject her parents’ urgings to stay put in the nest for a while longer? Did she finally turn her back on the help they wanted to give her? She didn’t have the experience to know what to do, where to find food, shelter and safety. She wasn’t mature enough to leave the nest, and yet she did. All we could do was bury the little bird and wonder about the life she never lived. That spring day we were able to talk about the need for children to listen to their parents—and about how children treat each other. That spring day we were able to talk about the need for children to listen to their parents—and about how children treat each other. It was the perfect time to point out to my own little boy the importance of listening to Mom and Dad. The Bible teaches, “Children, always obey your parents. This is pleasing to the Lord” (Colossians 3:20, God’s Word Translation). I reminded him of how much we loved him and how, like this little bird’s parents, we wanted to do everything we could to help him grow up strong and wise. But he had to listen and obey. Most families experience some degree of sibling rivalry, and ours was no exception. No one is closer to you physically or genetically than your brothers and sisters, and yet tolerance for irritations and little hurts is often lowest between siblings. Baby birds, like little children, see only themselves and their own wants and needs. So, as our children grow, they need to understand the importance of looking out for others, especially their family members. This is an important fulfillment of Jesus’ command to lay down our lives for each other (John 15:13). Just like that little bird, every child has a marvelous potential given by the great Creator God. Our bird had the potential to fly free, soaring above the trees wherever wind and fancy would take her. She would have fed on bugs or seeds or berries, sung the song and built the kind of nest her species was known for, and one day with a mate of her own raised her own little ones who would have had the potential to do the same. That tiny bird’s parents worked tirelessly to feed and care for her, but they were limited by the abilities God gave them. We human parents do all we can to teach and care for our children, but we have only limited experience, wisdom and foresight. All of us as parents live what is written in Hebrews 12:9-10, making the best decisions we can for our children, but understanding we are not perfect. However, we all have a Father who also works tirelessly to care for us—and He is unlimited in power, wisdom and ability! There is nothing that is beyond His capability to do and take care of for us—and He promises that if we are obedient, patient and faithful, He will always work things out for our ultimate good (Romans 8:28). We just can’t afford to become impatient, like that little bird may have been. We have to patiently wait on our Father and use the time we have to grow and gain the physical and spiritual maturity we will need to be a child of God. That warm spring day is now many years in the past. Many generations of baby birds have been born in those trees and spent their lives flying free and living up to the potential God gave them. And my little boy is no longer a little boy, but a grown young man in whom I’m quite pleased. However, the lessons that presented themselves that long-ago afternoon are still valid and important. No matter the trials and difficulties we may face, no matter the questions we have and the answers we lack, we must never forget that we have a loving God who, as a perfect parent, works tirelessly to provide what we need and help us build the character He wants to see in us. That baby bird provided a window to talk about these important life lessons. When those unexpected windows come for you and your children, be ready to take advantage of them. These little lessons may turn out to be the most memorable.